Our aim was to determine the relationships between autoantibodies to zinc transporter 8 (ZnT8), genotypes of the ZnT8-encoding gene SLC30A8 and type 1 diabetes risk. ZnT8 autoantibodies (ZnT8A) were measured in sera of 1,633 children with a first-degree family history of type 1 diabetes and who were prospectively followed from birth. Antibodies were measured by Protein A-based radiobinding assays and COOH-terminal (R325, W325 or Q325 variants) or NH2-terminal constructs of human ZnT8. SLC30A8 genotyping at single-nucleotide polymorphism (SNP) rs13266634 was performed on 1,170 children. Antibodies against COOH-terminal ZnT8 constructs (ZnT8A-COOH) developed in 58 children as early as 9 months of age (median 3 years). They were detected in 55 of 128 (43%) children with autoantibodies to insulin, GAD and/or insulinoma-associated protein 2 and 34 of 42 (81%) who progressed to diabetes. The additional presence of ZnT8A-COOH stratified diabetes risk in islet autoantibody-positive children (p < 0.0001). SLC30A8 genotype strongly influenced ZnT8A type and diabetes risk in ZnT8A-COOH-positive children. Antibody binding against the ZnT8 R325 variant was strictly correlated with the number of the corresponding SLC30A8 R325-encoding alleles, whereas binding against the W325 variant was highest in children who had SLC30A8 W325-encoding alleles (p = 0.001). Moreover, ZnT8A-COOH-positive children who carried homozygous SLC30A8 SNP rs13266634 genotypes progressed faster to diabetes than those who were heterozygous (59% [95% CI 42.3–75.7%] vs 22% [95% CI 0–44.3%] within 5 years; p = 0.01). Autoimmunity against the COOH-terminal region of ZnT8 is a highly relevant prognostic feature in childhood type 1 diabetes. Risk stratification in ZnT8A-COOH-positive children is further improved by SLC30A8 genotyping. The online version of this article (doi: 10.1007/s00125-009-1438-0) contains supplementary material, which is available to authorised users. Screening for autoantibodies against pancreatic islet beta cell autoantigens is helpful in identifying children who will develop type 1 diabetes [1, 2, 3, 4, 5]. Autoantibodies associated with type 1 diabetes include those directed to insulin (IAA), GAD-65 (GADA), insulinoma-associated protein 2 (IA-2) (IA-2A) and the related IA-2β molecule. Diabetes risk is correlated with the number of these antibodies, in that children who are positive for at least two autoantibodies and have a genetic susceptibility for type 1 diabetes have a 50% or more risk of developing diabetes within 10 years [3, 4, 6]. The cation efflux transporter zinc transporter 8 (ZnT8)  has recently been identified as a novel target autoantigen in patients with type 1 diabetes . Autoantibodies to ZnT8 (ZnT8A) are detected in about 70% of patients at diabetes onset. Moreover, several patients presenting with just a single islet autoantibody were shown to be also positive for ZnT8A, suggesting that this could be a marker for improving stratification of type 1 diabetes risk. An intriguing observation has been the demonstration that a principal epitope targeted by ZnT8A is influenced by a single amino acid (aa) at position 325 encoded as arginine, tryptophan or glutamine by different polymorphic variants of the ZnT8-encoding gene, SLC30A8 [9, 10]. Of interest, the SLC30A8 gene has been shown to influence susceptibility to type 2 diabetes [11, 12, 13, 14], and preliminary data in type 1 diabetes suggest that it may influence the timing of diabetes onset . In order to determine the impact of both ZnT8A, as an additional marker, and the SLC30A8 polymorphism, as an additional factor, in the prediction of type 1 diabetes, we have combined ZnT8A measurement and SLC30A8 genotyping in a cohort of children followed from birth through to adolescence. 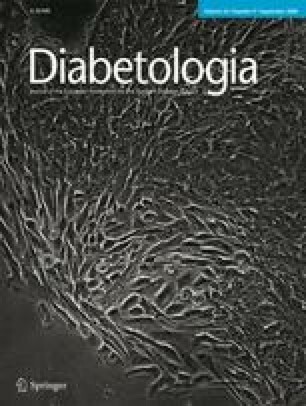 We find that previous associations between ZnT8A and SLC30A8 genotype reported in type 1 diabetes are also strongly present in islet autoantibody-positive children, that ZnT8A are an additional useful marker to stratify diabetes risk in islet autoantibody-positive children, and that there is a relationship between the SLC30A8 genotype and progression to diabetes in ZnT8A-positive children. Samples analysed in this study were obtained from 1,633 children with a first-degree relative with type 1 diabetes and who had been prospectively followed from birth for the development of islet autoantibodies and diabetes in the German BABYDIAB study . The median follow-up from birth was 10.8 years (interquartile range [IQR] 8.2–12.8 years). Children were routinely tested for IAA, GADA and IA-2A at age 9 months and at 2, 5, 8, 11, 14 and 17 years. If children had a positive autoantibody finding, they were asked to provide a sample for confirmation of autoantibody status within 6 months and provide samples yearly. Samples were no longer collected if a child developed diabetes. The cumulative dropout rate was 2%, 8%, 17% and 23% by age 2, 5, 8 and 11 years, respectively. By April 2008, a total of 128 children had developed IAA, GADA and/or IA-2A that were positive in at least two consecutive blood samples. Sixty-nine of these 128 children had developed two or more of IAA, GADA or IA-2A (multiple antibodies) and 42 had developed type 1 diabetes. The BABYDIAB study was approved by the ethical committee of Bavaria, Germany (Bayerische Landesärztekammer No. 95357). All families gave written informed consent to participate in the study. Investigations were carried out in accordance with the principles of the Declaration of Helsinki as revised in 2000. IAA, GADA and IA-2A were determined as previously described [16, 17]. IAA were measured by Protein A/G radiobinding assays using 125I-labelled recombinant human insulin labelled at tyrosine aa14 , and GADA and IA-2A were measured by Protein A radiobinding assays using [35S]methionine-labelled in vitro transcribed/translated recombinant human GAD65 and IA-2ic, respectively . The upper limits of normal were determined using Q–Q plots as previously described , corresponded to the 99th percentile of control children, and were 1.5 local units/ml for IAA, 25 WHO units/ml for GADA and 4 WHO units/ml for IA-2A. Using these thresholds for positivity, the assays had sensitivities and specificities of 70% and 99% (IAA), 86% and 93% (GADA), 72% and 100% (IA-2A) and 84% and 100% for multiple islet autoantibodies in the Third Diabetes Autoantibody Standardization Program Proficiency Workshop . The inter-assay CV values for samples with low autoantibody levels were 11% (IAA), 18% (GADA) and 16% (IA-2A). For the establishment of ZnT8A assays the cDNAs corresponding to the NH2-terminal domain (aa1-74) and COOH-terminal domains (aa268-369) of the R325, W325 or Q325 allelic variants of ZnT8 were amplified by RT-PCR from human pancreatic islet total RNA. Ethical approval for the human islet source was obtained from the ethical review board of the Fondazione Centro San Raffaele di Monte Tabor. Gene-specific primers included an EcoRI restriction site and in the case of the forward primer also an artificial codon start within the context of a canonical Kozak sequence. Amplified cDNAs were cloned into the EcoRI site of the pTnT plasmid vector (Promega, Hercules, CA, USA). Clones used for protein production were checked for correct sequence and orientation. For in vitro transcription and translation the plasmid DNA was prepared using Qiagen midi columns (Qiagen, Hilden, Germany). ZnT8A were measured by Protein A radiobinding assays as previously described for GADA and IA-2A . Antibodies against the COOH-terminal part of ZnT8 (ZnT8A-COOH) were tested using COOH-terminal (aa268-369) constructs of the ZnT8 R325 (ZnT8RA), W325 (ZnT8WA) and Q325 (ZnT8QA) variants, respectively. Antibodies against the NH2-terminal part of ZnT8 (ZnT8A-NH2) were tested using an NH2-terminal (aa1-74) construct. Briefly, 2 µl serum was incubated in duplicate for 20 h at 4°C together with 25,000 cpm of [35S]methionine-labelled in vitro-transcribed/translated (TNT SP6 Quick Coupled Transcription/Translation System; Promega, Mannheim, Germany) recombinant human ZnT8 constructs in 20 mmol/l TRIS-buffered saline, pH 7.4, containing 0.15% (vol./vol.) Tween-20 (TBST) and 0.1% (wt/vol.) BSA in a final volume of 27 µl. Immune complexes were precipitated for 60 min with 1.5 mg Protein A-Sepharose (Amersham International, Amersham, UK) pre-swollen in 50 µl TBST, subsequently washed five times in TBST by centrifugation, and counted in a scintillation counter (TopCount Microplate Scintillation Counter; Packard, Rodgau, Germany). Autoantibody results were expressed as arbitrary units that were derived from standard curves. For generating the standard curves, pooled sera from 20 patients with recent-onset type 1 diabetes diluted with pooled sera from healthy blood donors were used in all ZnT8A-COOH assays, and dilutions of one serum from a patient with very strong binding to the NH2-terminal construct were used in the ZnT8A-NH2 assay. Thresholds for positivity were determined using Q–Q plots of the BABYDIAB sample data as previously described , corresponding to the 99th percentile of control children, and were set at 16 units/ml for ZnT8RA, 30 units/ml for ZnT8WA, 60 units/ml for ZnT8QA and 15 units/ml for ZnT8A-NH2. Thresholds for ZnT8A were validated by analysis of Q–Q plots in a separate set of 100 blood donors and 415 patients with type 1 diabetes. The inter-assay CV values for samples with intermediate positive autoantibody levels were 17% (ZnT8RA), 16% (ZnT8WA), 19% (ZnT8QA) and 14% (ZnT8A-NH2). In this study, ZnT8A-COOH were measured in the last available follow-up blood sample from all children (n = 1,633). For children who developed diabetes, the last available follow-up sample prior to diagnosis and, if available, a sample taken at diagnosis were tested. ZnT8A-NH2 were measured in the last available sample from 574 children that included all ZnT8A-COOH and/or other islet autoantibody (IAA, GADA or IA-2A)-positive children and HLA DR3- and DR4-matched islet autoantibody-negative children. For each antibody-positive child at least four antibody-negative children were matched with respect to the presence and number of DR3-DQ2 and DR4-DQ8 haplotypes, respectively. In those children who were found positive for any of the ZnT8A specificities, all available earlier follow-up samples were measured. Genomic DNA was extracted from heparinised blood from 1,170 children using standard procedures and subjected to genotyping by Taqman assay (assay ID C_357888_10; Applera Italia, Monza, Italy) of single-nucleotide polymorphism (SNP) rs13266634 encoding for the polymorphic variants at residue aa325 of ZnT8 Arg or Trp (R325W), according to the manufacturer’s instructions using an ABI 7000 (ABI, Waltham, MA, USA). Selected genotypes were verified by automated sequencing on an ABI 3130 sequencer (ABI). The Mann–Whitney U or the Kruskal–Wallis H test was used to compare continuous variables between groups. Fischer’s exact test or the χ 2 test for trend was used to compare prevalence between groups. Life-table analysis was used to calculate cumulative frequency of ZnT8A-COOH in children, and to compare diabetes outcome for autoantibody-positive children with different covariate categories. A child was considered to have a positive ZnT8A-COOH outcome if at least two consecutive positive samples for antibodies to one or more of the COOH-terminal ZnT8 variants were found. The age at the first ZnT8A-COOH-positive sample was used as the event time. Analysis considered censoring for losses to follow-up and for children with ZnT8A-COOH-negative status at the follow-up visit age of their last autoantibody-negative sample. For analyses of diabetes risk in the islet autoantibody-positive children, the time between the first autoantibody-positive sample and diagnosis of diabetes or last contact was defined as the time to event for diabetes status. When life-table analysis included only the subgroup of children with ZnT8A-COOH, the time between the first ZnT8A-COOH-positive sample and diagnosis of diabetes or last contact was defined as the time to event. Significance of differences between groups was determined using the logrank test. The AUC of ZnT8RA and ZnT8WA binding on follow-up was calculated for children with antibody reactivity to both the ZnT8 R325 and W325 variants using Tai’s formula . AUC calculation considered direct (cpm) binding to the R325 and W325 variants, respectively, measured in all follow-up samples of an individual child. For all analyses, a two-tailed p = 0.05 was considered significant. Statistical analyses were performed using the Statistical Package for Social Science (SPSS 16.0; SPSS, Chicago, IL, USA). Fifty-eight children developed persistent antibodies against at least one of the COOH-terminal ZnT8 constructs bearing Arg, Trp or Gln at aa325 (ZnT8A-COOH). ZnT8A-COOH developed at a median age of 3.2 years (IQR 2.1–5.4 years). Their cumulative frequency was 2.8% (95% CI 2.0–3.6%) by age 5 years, 3.7% (95% CI 2.7–4.7%) by age 8 years and 4.6% (95% CI 3.3–5.9%) by age 11 years (Fig. 1a). The 58 ZnT8A-COOH-positive children included 50 of the 69 (72.5%) children with multiple other islet autoantibodies (at least two of IAA, GADA or IA-2A), five of the 59 (8.5%) with a single other islet autoantibody (three single IAA and two single GADA-positive children) and three of the 1,505 (0.2%) islet autoantibody-negative children. ZnT8A-COOH preceded the development of other islet autoantibodies in one child, developed at the same age as other islet autoantibodies in 24 children, and after another islet autoantibody in 30 children. ZnT8A-NH2 were detected in 20 of 574 (3.5%) children, including eight (13.8%) of 58 ZnT8A-COOH-positive, two (2.8%) of 72 ZnT8A-COOH-negative but islet autoantibody-positive children, and ten (2.3%) of 444 autoantibody-negative children (p < 0.0001). ZnT8A-NH2 first appeared at a median age of 6.3 years (IQR 3.6–11.4 years), which was later than the appearance of ZnT8A-COOH (p = 0.01). Among the 58 ZnT8A-COOH-positive children, 54 (93.1%) had ZnT8RA, 46 (79.3%) ZnT8WA and 46 (79.3%) ZnT8QA (Fig. 1b). Screening for ZnT8RA and ZnT8WA could identify all 58 ZnT8A-COOH-positive children. The majority (67%) had antibodies to all three variants, suggesting reactivity to epitopes in which residue 325 may have little contribution. Nine children (15.5%) had antibodies to only one of the ZnT8 aa325 variants. Follow-up of the ZnT8A-COOH-positive children showed further heterogeneity (Electronic supplementary material [ESM] Fig. 1). Half of the children had antibodies to all variants with similar dynamics over time (ESM Fig. 1a). Other patterns included significantly stronger (ESM Fig. 1b) and/or earlier (ESM Fig. 1c) antibody responses to one of the variants, and children who had antibodies to only one of the variants throughout follow-up (ESM Fig. 1d). DNA was available for SNP rs13266634 (R325W) analysis from 128 islet autoantibody-positive children, including 52 ZnT8A-COOH-positive children, and from 1,042 autoantibody-negative children (Table 1). SLC30A8 genotypes were strongly associated with the ZnT8 aa325 variant bound by autoantibodies. All 11 children who were ZnT8RA-positive but ZnT8WA-negative throughout their follow-up had at least one allele of the arginine-encoding R325 codon variant CCG (C allele), including nine (82%) who were homozygous (CC genotype). In contrast, all four children who were ZnT8RA-negative but ZnT8WA-positive throughout their follow-up had at least one allele of the tryptophan-encoding W325 codon variant TCG (T allele), including two who were homozygous (TT genotype) (p = 0.001; Table 1). SLC30A8 genotype distribution in 37 children with ZnT8A-COOH that bound both the R325 and W325 variants was similar to that of islet autoantibody-negative children (p = 0.2; Table 1), but SLC30A8 genotype was associated with the relative antibody binding against the ZnT8 aa325 variants in these children (ESM Fig. 2). AUC-ZnT8RA/AUC-ZnT8WA ratios were significantly higher in the 22 children with the CC genotype (median ratio 0.7; IQR 0.3–11.5), than those of 13 children with the CT genotype (median ratio 0.3; IQR 0.2–0.4) and two with the TT genotype (p = 0.004). Thirty-four (59%) of the 58 ZnT8A-COOH-positive children, eight (11%) of 73 ZnT8A-COOH-negative but other islet autoantibody-positive children, and none of the 1,502 islet autoantibody-negative children developed diabetes (p < 0.0001). The 5 year cumulative type 1 diabetes risk from the time of appearance of ZnT8A-COOH in the 58 children was 48% (95% CI 34–62%). The additional presence of ZnT8A-COOH stratified diabetes risk in children with IAA, GADA and/or IA-2A (p < 0.0001; Fig. 2). Among the 59 children who were previously classified as single islet autoantibody-positive, three of the five (60%) ZnT8A-COOH-positive children developed diabetes on follow-up, compared with two of the 54 (4%) ZnT8A-COOH-negative children (p = 0.003). Of the 69 children who were previously classified as multiple islet autoantibody-positive, 31 of the 50 (62%) ZnT8A-COOH-positive children and six of the 19 (32%) ZnT8A-COOH-negative children developed diabetes on follow-up (p = 0.03). Among the 20 ZnT8A-NH2-positive children, four (20%) developed diabetes. All four were also positive for ZnT8A-COOH, IAA, GADA and IA-2A. Hence, ZnT8A-NH2 did not stratify diabetes risk in islet autoantibody-positive children. Homozygous polymorphisms encoding for ZnT8 R325 (CC genotype) or W325 (TT genotype) were associated with progression to type 1 diabetes among children who developed ZnT8A-COOH. Diabetes developed in 77% of ZnT8A-COOH-positive children with either CC or TT genotypes, compared with 18% of ZnT8A-COOH-positive children with the CT genotype (p < 0.0001; Table 1). The 5 year diabetes risk in ZnT8A-COOH-positive children who carried the CC or TT genotype was 59% (95% CI 42–76%), and 22% in ZnT8A-COOH-positive children who carried the heterozygous CT genotype (95% CI 0–44%; p = 0.01; Fig. 3). Protection against diabetes by the heterozygous CT genotype was evident in the children who had ZnT8A-COOH binding all three variants (p = 0.0004; ESM Table 1). Further stratification of ZnT8A-COOH-positive children on the basis of reactivity to the aa325 variants resulted in small numbers and was therefore not informative with respect to determining whether the genetic effect on diabetes risk was restricted to particular epitopes. Diabetes risk was not significantly stratified by SLC30A8 genotype among islet autoantibody-positive children who were ZnT8A-COOH-negative (Table 1). Type 1 diabetes is preceded by autoantibodies to beta cell antigens such as insulin, GAD and IA-2, and many but not all of the children who develop these antibodies progress to diabetes during childhood [6, 20, 21, 22, 23, 24]. Here we show that antibodies to the COOH-terminal domain of the recently identified autoantigen ZnT8  are present in the early pathogenesis of type 1 diabetes and help stratify diabetes risk in islet autoantibody-positive children. We further show that the genotype of the SLC30A8 gene that encodes variants of a ZnT8 COOH-terminal epitope at aa325  determines autoantibody specificity and levels and rate of progression to diabetes in ZnT8A-COOH-positive children. Our study is the first to report humoral autoimmune responses against ZnT8 and SLC30A8 genotype in a large cohort of children with a first-degree family history of type 1 diabetes. An important aspect of the study cohort is that it was prospectively followed from birth, thereby allowing us to determine the age of autoantibody appearance in each child and to track the course to diabetes onset. ZnT8A were measured by sensitive radiobinding assays, and because multiple samples were available in the children, positivity could be confirmed on follow-up. The limitations of the study include the fact that it is not population-based, but performed in a cohort enriched for type 1 diabetes susceptibility. However, unlike other similar cohorts [20, 21], the BABYDIAB cohort has not been further selected on the basis of HLA genotype. A potential limitation of the study design is that islet autoantibody-negative children were only tested for ZnT8A-COOH in their last available sample, thereby limiting the chances of detecting transient appearance of ZnT8 antibodies in these children. Finally, DNA was only available for SLC30A8 genotyping from 72% of children in our cohort. Genotype data were 91% complete in islet autoantibody-positive cases and conclusions with respect to genotype associations in this subset are therefore only minimally affected by missing data. Our data are consistent with previous reports in patients with type 1 diabetes showing that ZnT8A are directed against epitopes expressed in the COOH-terminal and, less frequently, within the NH2-terminal part of the protein . We show that ZnT8 is indeed an early target of autoantibodies in children from affected families. About 4% of 1,633 children from the BABYDIAB study developed ZnT8A-COOH, half of them by age 3 years, with the earliest appearance observed at age 9 months. The cumulative prevalence of ZnT8A-COOH during childhood was comparable with that of IA-2A and less than that of GADA and IAA. Although ZnT8A-COOH rarely preceded other islet autoantibodies, they first appeared together with IAA, GADA and/or IA-2A in 44% of the ZnT8A-COOH-positive children. In keeping with a previous report in patients , the majority of ZnT8A-COOH-positive children (93%) showed antibody reactivity against the ZnT8 R325 variant, and the remaining children had antibodies against the W325 variant, with two-thirds of ZnT8A-COOH-positive children having antibodies reactive to both polymorphic variants. We therefore recommend screening for antibodies to both of these major ZnT8 variants as a strategy to identify ZnT8A-COOH-positive children. Autoantibodies to the COOH-terminal part of ZnT8 were strongly related with disease development. Almost half of the children who developed ZnT8A-COOH in our cohort developed diabetes within 5 years after the appearance of these antibodies. Furthermore, ZnT8A-COOH could refine risk among children previously classified as single or multiple autoantibody-positive based on the presence of IAA, GADA or IA-2A. Autoantibodies to the NH2-terminal part of ZnT8 were often transient and did not add to diabetes risk stratification in these children. Moreover, half of the ZnT8A-NH2-positive children did not develop other islet autoantibodies, and none of those progressed to diabetes. The high diabetes risk associated with the development of ZnT8A-COOH is similar to that seen in children with antibodies to the IA-2 and in particular IA-2β autoantigens [5, 25, 26, 27, 28]. All of these antibody targets are the COOH-terminal cytosolic portion of secretory granule transmembrane proteins, suggesting a relative importance of autoimmunity to such proteins compared with other beta cell proteins in the pathogenesis of type 1 diabetes. It has recently been shown that a common non-synonymous polymorphism at position 325 is located in the COOH-terminal region of ZnT8 where more than 60% of new-onset type 1 diabetes patients exhibit ZnT8A binding , and that the SLC30A8 R325W SNP influences the antibody responses in patients [9, 10]. We have now concordantly found a remarkable restriction of autoantibodies to the ZnT8 R325 or W325 variants, depending on the presence of corresponding C or T alleles of SNP rs13266634 in children prior to diabetes. Although there was no significant difference in SLC30A8 R325W allele frequencies between autoantibody-positive and -negative children in our cohort as a whole, a strong genetic effect was observed on the target specificity of ZnT8A-COOH. The frequency and levels of ZnT8A-COOH that bound the R325 variant but not the W325 variant were much higher in ZnT8A-COOH-positive children with homozygous SLC30A8 genotypes encoding for R325 than in children with at least one SLC30A8 allele encoding for W325. The same was true for W325-restricted ZnT8A-COOH, which were never found in children with homozygous C alleles encoding for R325. We therefore confirm the importance of the variant residue at aa325 as a key determinant of humoral autoreactivity to ZnT8, and the SLC30A8 genotype as a determinant of autoantibody specificity in preclinical type 1 diabetes. Novel in our findings with respect to the SLC30A8 R325W genotype was a surprising, but strong, association with diabetes development in ZnT8A-COOH-positive children. Risk was markedly higher in carriers of CC or TT homozygous genotypes. Importantly, the association was observed independently of the association of the homozygous genotypes with epitope specificity. Overall, 75% of the children who progressed to diabetes in our cohort were ZnT8A-COOH-positive and homozygous for either the CC or TT genotype. Potential mechanisms for the associations between diabetes risk and homozygous genotype are speculative. Of note is that the association is only seen in ZnT8A-COOH-positive children and not in islet autoantibody-positive children who were ZnT8A-COOH-negative, suggesting that the relationship may have to do with the extent of autoimmunity and the expression of cognate autoantigen. Regardless of the mechanism behind our observation, the current data indicate that genotyping at SNP rs13266634 could be an effective secondary screening step to stratify diabetes risk in ZnT8A-COOH-positive individuals. The observations with respect to SLC30A8 genotype and progression to diabetes in our cohort need verification in older individuals and other cohorts. It is worth considering that in a separate cohort we found an increased prevalence of the SNP rs13266634 C allele in children who developed type 1 diabetes before age 5 years . Thus, both studies indicate that the SLC30A8 genotype affects the age of diabetes development. Nevertheless, the findings in the current study are not strictly consistent with those of the case–control cohort, since homozygosity for the uncommon T allele was rare in the patients with young-onset diabetes in the case–control cohort and risk of diabetes was high in ZnT8A-COOH-positive children with either the CC or the TT genotype in the current cohort. The differences are, however, not irreconcilable since from the current data it is apparent that ZnT8A-COOH status is likely to be important in the genetic associations, and this was not measured in the case–control cohort. Thus, in the case of SLC30A8, autoantibody status may need to be considered in data stratification of genetic studies. In conclusion, autoimmunity against the COOH-terminal region of ZnT8 is a highly relevant prognostic feature of type 1 diabetes development, particularly in homozygous carriers of the ZnT8 R325 or W325 variants. Our findings may improve prediction of type 1 diabetes risk and suggest that autoantigen genotype may influence the pathogenesis of autoantibody development and rate of disease development. This study received support from the Deutsche Forschungsgemeinschaft (ZI 310/12-6), the Juvenile Diabetes Research Foundation (1-2006-665), the European Union (EP7-HEALTH-2007, DIAPREPP N202013), the Federal Ministry of Education and Research of Germany (Kompetenznetz Diabetes mellitus/Competence Network for Diabetes mellitus, FKZ 01GI0805-07), the DFG-Center for Regenerative Therapies Dresden, Cluster of Excellence at the Dresden University of Technology, and the Helmholtz Center Munich. P. Achenbach was supported by the Juvenile Diabetes Research Foundation (11-2005-1117) and K. Koczwara by the NIH/DFG Research Career Transition Award Program (KO 3418/1-1). The authors thank U. Mollenhauer, A. Jäger and A. Knopff for technical support. This study forms part of the dissertation of U. Landherr.